Organizations that receive funding from RACC are required to incorporate our logo into your printed programs, advertisements, and other collateral materials. Please consult your RACC contact to understand minimum logo requirements, and which logos to use. If you have questions, contact Jeff Hawthorne at 503-823-5258 or jhawthorne@racc.org. The RACC logo is available in several formats. Choose the color, configuration, file format, and resolution that work best for your application. To download, click the appropriate link (EPS, JPG, or PNG) below each image. When using these logos, do not separate them or any of their components. Do not rotate, stretch, or otherwise distort the dimensions of the logo. Please take care to retain adequate white space around the logos when including them among other graphical elements in a publication; there should generally be space around the logos on all sides equal to or more than the height of the logos. All logos are available in color, but may also be printed in plain black, allowing for flexible use in almost any publication. When printing logos on a colored or black background, please use the logo that best stands out on the background. For dark colors and black backgrounds, it may be preferable to “knock out” or “reverse out” the logos, thus having them appear as white. 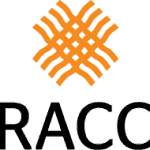 This version of the RACC logo, which includes only our acronym, is only to be used in situations where the RACC logo is being published at ½” tall or smaller. Please use the logos above whenever possible; if those logos become illegible in your publication, use the logo below. 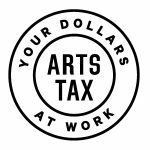 To help communicate where arts tax dollars are ultimately invested, RACC has developed an Arts Tax emblem. 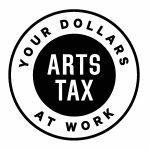 We encourage arts organizations that receive arts tax funding through RACC to include this emblem in programs, posters, websites, print ads and other collateral materials. If you have questions about using the RACC and Work for Art logos, would like to manipulate the logos in any way, or would like to receive the logos in additional formats for use in certain design programs, please contact Jeff Hawthorne at 503-823-5258 or jhawthorne@racc.org.